After awhile you will develop radar for collectible items, and spot them out of the corner of your eye as you walk down swap meet aisles, or scroll through eBay searches. But if you are a beginner, you might want to be a little careful or else you will end up with a bunch of junk, spreading your collecting funds so thin that when something really nice comes along you won’t be able to afford it. Begin by deciding what you want to own, and make a prioritized list. Use the photos in books like this and the photo guides listed in the bibliography to help you narrow in on what you want. Track the comings and goings of these items on eBay for awhile to get calibrated. I look at eBay more HERE. 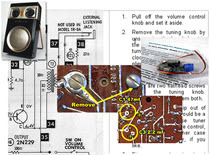 An easy way to spot mid-century radios is to look for the Conelrad or “CD” markings found on most, but not all radios sold in the United States between about 1953 and 1963. The markings appeared at 640 and 1240 on the AM dial, denoting frequencies that we were to turn to in case of the unthinkable. The marks are usually triangles or dots, but were sometimes stylized lines or other graphics. 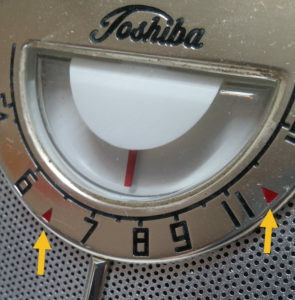 The Toshiba dial in the phots gas red triangles at 640 and 1240 on it's dial. 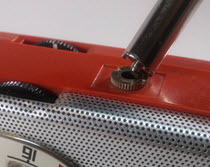 The lack of CD markings does not mean a radio is not a worthy collectible, and you might find many radios with CD markings uninteresting; but seeing the marks means you have found an item sold between about 1953 and 1963, what many feel was the golden age of transistor radios. (There is a great entry regarding Conelrad in Wikipedia. I hate to count the number of times I have told someone at church or at a social gathering that I collect mid-century electronics and have heard someone say “Oh. I wish I had known that. We just tossed out a bunch of dad’s old [fill in the blank]. I had no idea people collected that stuff. I made up little postcards that show pictures of what I collect. I hand them to friends, resale stores, and anyone else who might know someone who knows someone. Make and hand out "I buy.." cards. Much of the really good stuff is already in the hands of collectors, but that should not discourage you in the least. Here are some techniques I’ve used successfully. Flea markets are a potentially good way to find collectibles if you go armed with knowledge. Big shows like the Pasadena Rose Bowl events are a little overwhelming, but have plenty of potential. Go early. Wear comfy shoes. take sunscreen. Get there early. Scurry. Hand out your little "I buy..." cards to vendors, and even to other collectors if they appear to be "pickers" of related, but not directly competitive stuff. Mid-century furniture pickers, for example might be willing to tell you when they stumble upon electronics. Some pickers expect a finder's fee. Discuss this up-front. Jim Sargent hard at work. 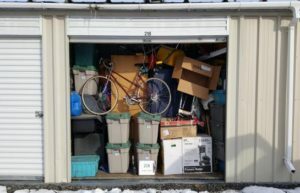 It is sometimes worthwhile to go to local auctions and estate sales, but it is time consuming, and you need to know what you are looking at, know how much it is really worth to you and then you must win, pay for, and get items back to your place without damaging them. Obviously the best prospects will be former HAMs or sales that mention old audio gear and so on. That's Jim Sargent From Sargent Auction Service in Texas keeping things moving. 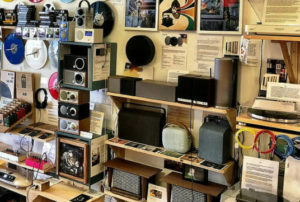 HAM organizations and radio museums often run fund raising auctions, and these are likely to have more items of interest to you than a typical estate sale, but then there will be more real competitors when the bidding starts. Since transistor sets are not always held in as high regard as tube gear in many of these settings, you can sometimes find some real bargains this way. You do want to open items up and examine them carefully if that’s permitted, since HAMs by nature love to tinker, and the sets might be damaged or incomplete. But hey, a $5.00 Zenith Royal 500H is worth it, even if only for parts. "Some live 'in person' auctions also allow online and/or proxy bidding. You might not need to be physically present to win.So before buying a plane ticket and spending a fortune on hotel rooms and rental cars, see if online bidding is possible." 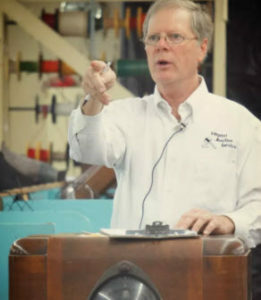 When going to commercial auctions (as opposed to radio club fund raisers) be aware that the auction house might tack on a seller’s fee, usually it’s a percentage of the ending bid price, so ask in advance how much that will be if anything, and factor this into your bidding. Check ahead of time also regarding payment options, deposit requirements and so on. Many auctions have preview days, or at least hours before the auction when you can look things over. At previews, resist the urge to shout “Oh Wow!” when you find a treasure hidden in a box of junk. It’s not unheard of for folks to bury the good stuff in such piles when they find them, by the way; but don’t move things from one lot to another. People find great mid-century electronics at auctions every week. Just don’t assume you are going to steal much. You will likely be bidding against eBay PowerSellers in the audience, of course, hoping to buy stuff cheap and resell it online, but you will also run into other collectors who don’t need to make a profit reselling things. They want these items because, like you, they hope to own them. This can drive prices up in a hurry. Call ahead. I recently saw an ad for an upcoming auction over 100 miles away. There was some vintage, high-end stereo gear I was interested in, but I wanted to know more about its condition before spending the time driving both ways and standing in the sun. The auctioneer described the items to me over the phone, without being terribly reassuring. He asked if I would like to make a proxy offer on the phone, or perhaps come to the auction. I offered a reasonable proxy bid amount for untested items in questionable physical condition, at least as he described it to me. The auctioneer laughed. “Don’t even bother. I collect this stuff too. There’s no way I’d let it go for that little. I’d buy it myself first!” Hmmm. Note to self: Get a job in an auction house. Still, it is worthwhile to get on auctioneers’ mailing lists. Go once in a while. Do your homework. Be prepared. Be brave. Take a shot. It will be fun, if nothing else. Many auction houses will send email notifications, and electronic catalogs if you request them. Use Google to find local auctioneers, or visit a local antique consignment store, pick up one of those free directories you’ll find in the front of the store and flip to the Auctions section. There should be plenty of local contact information there. At least one auction house specializes in vintage electronics, Estes Auctions, 7404 Ryan Road, Medina, Ohio, 44256. Phone 888.769.4992. Email estesauctions@aol.com. Here’s another hit-and-miss, but fun possibility. Folks who run those private storage locations auction off the contents of entire storage lockers when customers don’t pay their rent. The auctions are advertised several weeks ahead in local papers, and some places have online calendars and email notification options. The big chains seem to have auctions virtually every week somewhere in town. Realize that most of these lockers are not climate controlled, so any vintage collectibles inside have likely been exposed to temperature extremes, and possibly moisture. One last caveat. The owner can swoop in at the last minute and, probably with the help of his mom or girlfriend, pay the bill and rescue his stuff only moments before the auction starts. I told you it could be fun. There are still a few print periodicals that carry classified advertising aimed at electronics collectors. 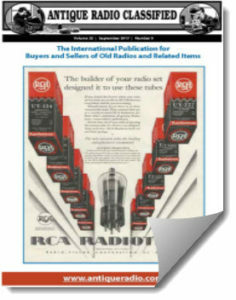 Perhaps the best-known and most prolific is the Antique Radio Classified publication, often referred to as simply A. R. C. The publishers also have an online presence which is the best way to subscribe to the printed magazine containing helpful ads and articles. You can also see the want ads online, and perhaps scarf stuff up before folks see the ads in print. You need a paper subscription to see the current month’s ads online. Visit www.antiqueradio.com. 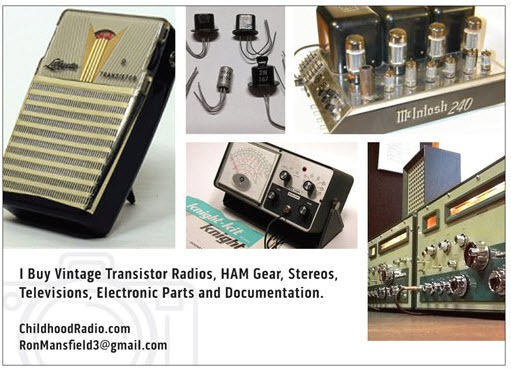 Speaking of Antique Radio Classified, their website and monthly booklet are both great sources of swap meet dates, club lists, book reviews and much more. Finally, you can sell stuff through A. R. C. as well. Subscribers can run one free 20-word ad per-month, and R.R.C.’s additional ad rates are quite reasonable. It’s a great way to reach radio enthusiasts. I have a friend who buys and sells trains, many of them on eBay. Whenever I go garaging I look for trains for him. He looks for radios for me. We haven’t found much for each other yet, but ya never know. Charity thrift shops (such as the ones run by Good Will and Salvation Army) were once thought to be ideal places for plucking unbelievable deals out of the hands of unsophisticated sellers. Besides the obviously dubious ethical side of this process, it’s mostly folklore now. Even the least sophisticated thrift shops have access to eBay today, and if anything, prices can sometimes be a bit over what you will pay for similar items online. You can ask store managers at Good Will and similar places to call you when electronics arrive, but in my experience this is a waste of your time. The store either has a policy forbidding this, or the manager never calls, Every operation is different however, and it costs nothing to try. Brick and mortar retailers have rent and utilities to pay, employees to feed, and so on. Not to mention taxes to pay. Those rented stalls you see in antique malls are run by private sellers who likely rent the floor space, (and maybe the display cases to), and then must give a percentage of their income to the shop owner. Make friends with mid-century retailers. Nonetheless, if you like to shop, these places are fun to visit. Many antique malls encourage, or even require their sellers to participate in sales, where items are marked down perhaps 10% or more. While often around holidays, (particularly Christmas), sales can happen at any time so keep an eye out. Here too, hand out your contact info and a list of what you are looking for. Some resale shops like Transistor Chicago actually specialize in mid-century stuff. Be sure you hand shop owners a card with your contact info and a list of things you collect. You might also meet some independent sellers in antique shops who don’t sell electronics, but will keep an eye out on your behalf and let you know when they spot things at an estate or garage sale and so on. Some folks will do this for free; others charge a finder’s fee. People who do this professionally are often referred to as “pickers” and you can ask antique shopkeepers to put you in touch with a few. Don’t be afraid to go looking for items. For a while I rented some display cases in a collectibles consignments shop. On one of them I’ve placed the sign advertising my Trading Assistant services. The sign on another case simply says “I Pay Cash Vintage Electronics,” and had photos of the stuff I am interested in purchasing. Online venues such as Craig’s List offer free “Wanted” ads. Try them. If you are a member of a club that publishes newsletters with want ads—HAM clubs, a senior center, and so on, advertise. What was your best find? How did it come to be yours? Where you you look, and for what?